2015 Events are listed below most recent first! 24 RV’s and 34 women gathered at Far Horizon’s 49er Village RV Park in Plymouth, CA. for our December outing. The Friday evening Meet and Greet was in the clubhouse with its nice warm fireplace kept stoked with wood by Linda and Shelly. Saturday started with a delicious potluck breakfast and then a rig warming for newbie Ellen McCord and her two dogs. Those that participated in Casper’s holiday cookie exchange came home with some delightful looking trays of cookies. Several people carpooled into Sutter Creek for lunch and to enjoy the Holiday festivities taking place in town with people dressed in period costume, carriage rides, crafts fair and decorated shops. Saturday evening we had a delightful Italian themed potluck dinner followed by our Secret Santa gift exchange led by Kathy Pearce. It was a great time with some fun gifts and lots of laughter. Decorated RV’s were voted on with Christine and Susan winning 1st place, Connie and Nancy 2nd and a tie for 3rd between Casper and Sue and Kathryn. We gathered again Sunday morning for our refrigerator cleanout breakfast and goodbyes. Those lucky enough to stay another day enjoyed dinner together on Sunday night at the local Mexican restaurant. Thank you Freewheelers, our donation table was overflowing with Holiday gifts for the Sleep Train Foster Kids. Another wonderful outing for our Annual Chapter Business Meeting held at Sugar Barge on Bethel Island. 88 FreeWheelers in attendance, occupying 60 spaces. Many arrived on Wednesday and stayed until Monday. On Friday evening we were fortunate enough to have Rachel Harp onsite to wow us with all of the latest in RV products on the market, and some of the just can’t live without, while Joel worked tirelessly making repairs on our rigs. Saturday morning brought a bounty of breakfast splendor. Quite an assortment, after which the business meeting was called to order. (Please see “minutes of the meeting”) After all business was complete it was off to fun & games. Some members displayed their wares, others offered free to good home items such as books, etc…and many participated in our famous washer toss game. Pics provided by Mary Sue. The winners were Sharyn L. and Martha Y. Following our Saturday Night Pot Luck we were entertained by DJ Arleen for a night of Karaoke & Dancing. Our chapter is so blessed with such voices. Our own chapter leader Celia Buckley sang such a beautiful song, you could have heard a pin drop. (Celia, it is always such a pleasure to hear you sing) Sunday morning brings yet another gathering for a refrigerator clean out…and to say our good byes until next month. Each and everyone of you, have a safe and Happy Holiday Season, as December will be my last outing as your Chapter activities coordinator, I want to wish Irene Paulin all of the fun that being involved with the Chapter has brought to me. I will look forward to seeing everyone on down the road soon. Location: Durango RV Park, Red Bluff,CA. summertime favorite campground because members can enjoy the Olympic size pool and hot tub. We had 22 rigs and 30 members attend. We had lots of Freewheelers out recruiting new members. In all, we had 7 guests as a result of this campaigning. Nancy Hart was getting ready to pull her last connection before heading home. Within minutes Marie Moore engaged her in conversation about RVW and talked her into staying another night and come join us. Nancy was probably the shortest guest we ever had. After going online, Nancy immediately signed up and joined RVW that day. with Adventure Caravans. All participants were RVW members except for the male tailgunner. We enjoyed all the advice and photos of the Alaska Wilderness. We had the usual “food” events including the ice cream social by the pool on Saturday afternoon. 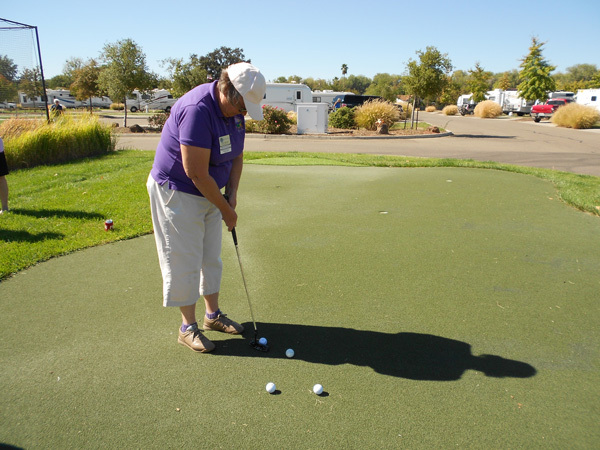 The afternoon event was a putting contest. Golfers and non golfers alike, joined in on the fun and competition. After quite a few “shootouts”the final winner was Irene Paulin. Way to go Irene! FreeWheelers returned to Casini Family Ranch Campground in Duncans Mills, California for a four day outing this August 27 – 30. A total of 36 rigs and 2 tents filled almost an entire section of the campground. Sixty-two women attended. Among them were 3 new members and 18 guests. 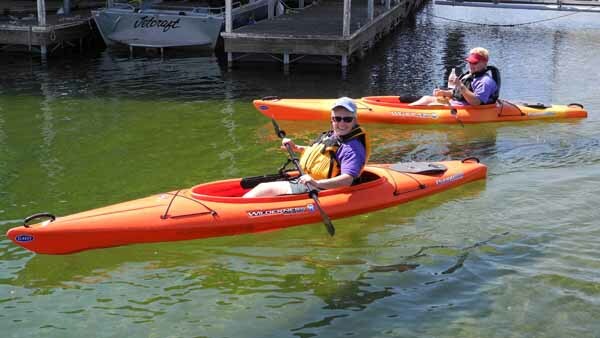 The Casini campground is located along the Russian River and attendees had the opportunity to enjoy the campground beach and kayaking, as well as the good restaurants and boutique shops in Duncans Mills. A highlight of the weekend was a birthday party at the Saturday night potluck dinner. Seven women born in August and 5 born in September were crowned with birthday tiaras. The group voted on the funniest birthday cards among those brought by attendees and tried to guess which baby picture was a picture of which adult. Prizes were awarded for several of the games. Martha Woods and her wife Sabrina Sandiland provided party entertainment. The duo sang a set of 6 songs as Martha accompanied them on her guitar. After dinner, the August and September birthday gals blew out the candles on two birthday cakes. No one told what their wish was. 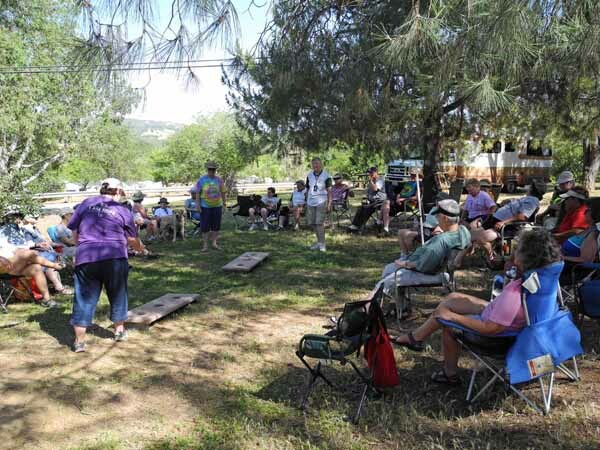 The feedback from the group was that everyone had a good time and so the campground has been scheduled for a FreeWheelers event August 18 – 22 next year. Shelly and Linda took their fire mastery and had a roaring fire for us to roast Charlie’s wonderful gigantic marshmallows and had some fun conversation!! We had a couple of rigs stay from Tuesday to Sunday, so that tells me,, we like it there!! Saturday night we had Mexican Theme dinner and you would have thought we had not eaten all weekend,, or at least for a few hours.. Everything was wonderful as always is when we eat!! Nobody lost dishes, we managed to re-home some of Shirley and Jane’s Wine Glass collection, thanks to Marie for bringing those.. Played a silly camping trivia game I brought,,We Are Smart!!! What does RV stand for??? Those of us that stayed Sunday night, we went to the Farmhouse next door and had a scrumptious dinner with a view of their lovely gardens. Surprise, surprise, another hot weekend at Woodson Bridge. 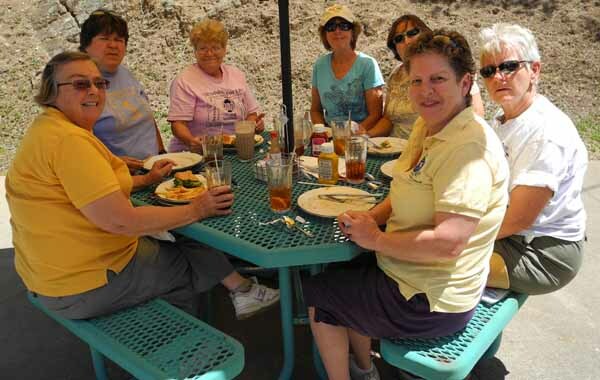 In spite of the heat, 21 women gathered at the scenic and shade laden RV Park on the Sacramento River. Fri night we had the usual low key meet and greet. Sat morning we were treated to the now famous biscuits and gravy by Susan and Beth. Then we had a wonderful presentation from Sue Clark on RV 2 the Rescue and Pilots N Paws. 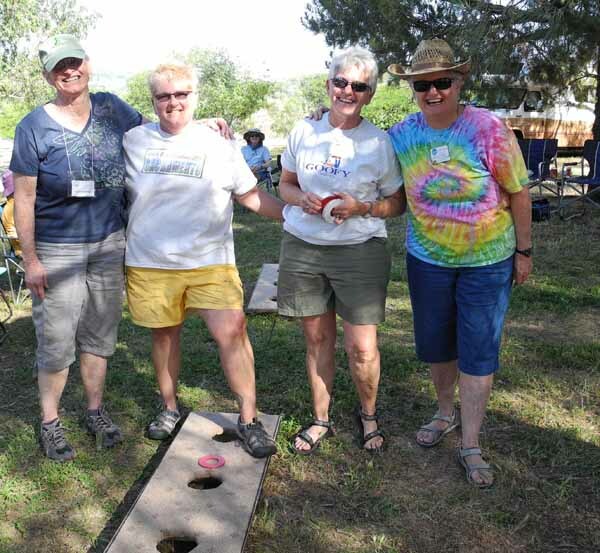 Later in the morning we were treated to a washer toss competition sponsored by Kate and June. Most women at the outing participated in this. The talented winners were Faye Mendenhall and Marilyn Leone. Following dinner on Sat. night we enjoyed a few rounds of Bingo with our gracious caller Renee doing the honors. There were very few winners other than Faye Mendenhall who won 3 of the 5 games. We will never know her secret for winning so many times. We skipped the campfire on Friday night because of the heat. Saturday night’s made up for it with Connie McKenna starting the fire at 4:30pm so the coals would be just right for wienie roasting! Side dishes were exceptionally delicious and notable in that there were no potato chips on the table. We’re eating healthier for sure! Later the fire was rekindled so that all variations of S’mores could be enjoyed. Beth took orders for marshmallows from golden brown to charred for anyone not wanting to do her own. Chocolate still seems to be the favorite ingredient among FreeWheelers with graham crackers the least necessary. No one went home hungry tonight! Many who hung around for Sunday night enjoyed a big lunch at the café (Photo 093), napping, reading, a little washer toss and then another campfire to roast those left over hot dogs and enjoy the full moon. What a way to end a wonderful weekend! One last thing we wanted to share was a tip about cleaning sap out of clothing. While the new picnic tables’ benches were great, some of us sat down too quickly. Tennie and Anne (guests) told us that hair spray (pump or spray) would work and indeed it has. Blue jean material as well as canvas light brown shorts came clean in one wash after spraying generously! Thank you Tennie and Anne! The Easter Bunny hopped to Jackson April 2-5 as did almost 80 ladies!! On Thursday, 50 ladies showed up, and Friday saw the rest of the ladies…very eggciting!! The Jackson Clubhouse was decorated with pastel tablecloths, balloons, placemats with Easter stickers, containers of candies…and Bunny feet to direct people to the “Eating Tables”. Friday was our delicious potluck appetizers with many eggcellent dishes! Saturday was quite a full day and that’s no eggsaggeration! The morning began with our traditional potluck breakfast…many wonderful egg dishes, of course! The Biggest Little Kitchen Store from Jackson gave us a wonderful presentation of the newest kitchen wares on the market and information about knives…how to pick the best ones out, etc. They didn’t bring anything to sell, so ladies were “forced” to go to their eggstraordinary shop! 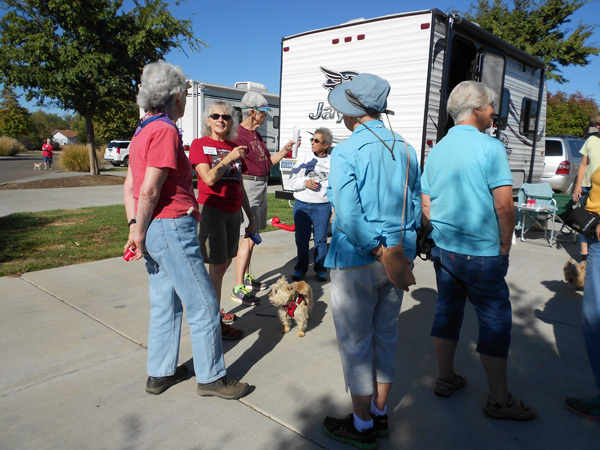 In the afternoon, two of our members, Mary Sue Ferrell and Irene Paulin, presented a 2-hour educational program directed to members who are thinking about buying another RV. Four ladies on the panel gave eggstremely good points of things to look for when making the decision! Ladies then ventured out to view 15 rigs of different sizes, classes, and configurations. That was so much fun and many came out of their shells laughing and asking great questions to the rig owners! Thanks to Mary Sue and Irene were their work! Saturday evening was our egg-travagant dinner! We actually had to use 3 long tables to put all the food! No one left hungry!! But…the best was yet to come!! Arleen Huffman came with her Karaoke machine…and 5,000 titles! Many people went willingly to the microphone and a couple were FORCED to entertain! We partied till the Quiet Hour. Lots of fun! Thank you, Arleen! It’s Easter Sunday and how we were able to eat the next morning…well, we did at our Clean Out the Refrigerator Breakfast! At this point, most ladies left but from I understand, the 12-15 people left had a great time relaxing, hitting the casino for dinner and making money, and at camp, games came out. It really was an eggstremely fun weekend and eggsactly what was needed! That’s all, yolks!! Reportedly, a fabulous time was had by all at our annual retreat to “Casa de Everything”. We had a great turn out with 38 rigs (uh…that included 3 motel “rigs”) and 61 women. We had two new FreeWheeler members and 4 guests. About 20 rigs arrived on Thursday and 21 rigs stayed until Monday! FreeWheelers sure know how to eat! The tables were groaning with homemade delicacies at every meal. On Friday we had a potluck dinner followed by a wonderful presentation of “What’s new in the RV industry” by Rachel Harp. (In the background, husband Joel Harp was working hard on rig after rig during our outing. Harp’s mobile RV service is an invaluable treasure in our chapter.) Saturday morning breakfast was followed by an informational session led by Mary Sue Ferrell on “To tow or not to tow” with over 20 women in attendance. Saturday afternoon we had our 2nd annual self-defense class for women by Sensei Cris Giordano. About 18 women attended and felt they learned a lot and had much more confidence if confronted with a challenging situation. We all enjoyed another potluck dinner Saturday night followed by a group game of “Two Truths & A Lie” where each woman wrote out 3 things on a paper, and we tried to guess who they were, and then what the lie was. Some folks had been a bit dubious about this game, but it was overwhelmingly well received and fun. We then danced until 10 while DJ Master Arleen Huffman spun a marvelous set of music on her new DJ equipment. She sang “May I have this dance” absolutely beautifully! After breakfast on Sunday, more than 25 of us moved into Pacheco Hall for the super bowl party. As the Patriots won, some were sad; many were delighted; and all enjoyed a good time. Of course, during the weekend, many went shopping at the Casa de Fruta wine, food & sweet shops and some enjoyed their good restaurant on site. We also were delighted with a visit from FreeWheeler webmaster Peggy Chinn and Karen Kane on Saturday and hope to see them for a longer visit soon! Beginning the New Year at the Vineyard RV Park turned out to be a wonderful idea, with approximately 35 RVing women who took advantage of the opportunity. It was a “laid back” weekend, so everyone was free to plan activities as they wanted, helped out by the weather which was beautiful during the day, and cold at night. Some went out to dinner at Kettleman’s on Thursday night. Friday was an easy day with people pulling in and setting up, and the “Meet and Greet” went very well. Since the group was small, we got into some really great conversations and had a chance to catch up on the latest news. On Saturday morning, a lovely breakfast was followed by an information sharing session led by Mary Sue and Irene. 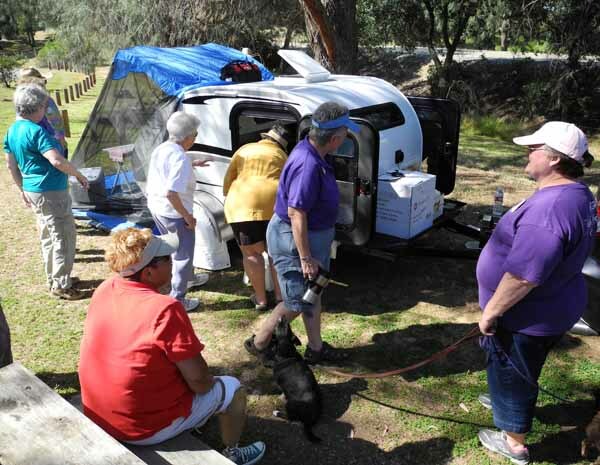 The group discussed trouble-shooting various issues on the RV, knowing and reading your manuals, and Beth shared how to get extra mileage with a fuel injection cleaner. It was a good session, and it was agreed that it was “to be continued”. Saturday was also spent in other fun activities such as visiting the Jelly Belly Factory, playing golf, watching the NFL wild card playoffs, visiting around town, in particular Camping World and the Outlet Stores, and also just hanging out and playing board games. During all of this, Polly actually taught Sue how to sew PJ pants! Dinner that night was fun and delicious, and one group stayed in the clubhouse until 11:00 playing board games! Sunday morning was low key and full of even more great conversations. We want to shout out a big thank you to everyone who helped clean up, and special kudos go to Ann Meyer, who handled registration. Thanks also to our outing volunteer for next year at the Vineyard, Sharon Schaurer.